Whenever a game is re-released or remastered in a new package and for a new console, there are always two reviews that are necessary at once. The first review is for those who have never played the game before, whether that be due to their age, a lack of interest, or not owning that original console. The second type of review is for those who have played the original and are wondering what all has changed so they know whether it is worth buying said game again. As with any of my other re-release reviews, I’m going to err on the side of those who have never played the original game, and as such the score will be reflected on the whole title’s worth, and I will also avoid as many spoilers as possible. Since this is a (multiple) murder mystery story, avoiding spoilers is virtually impossible, and as such I will not post any screenshots or talk about any events that are beyond the first chapter of each of these games. 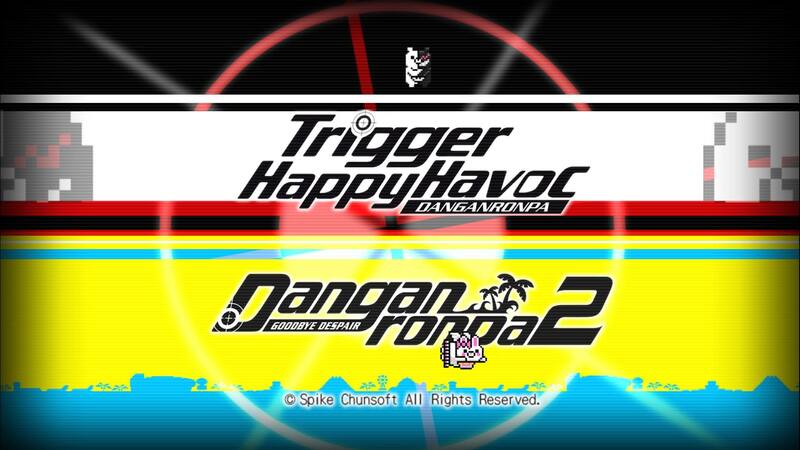 Since we have already reviewed both Danganronpa: Trigger Happy Havoc and Danganronpa 2: Goodbye Despair on the website, I will generally refer to those reviews for anything mechanic-wise, and then give my own opinion (since I was not the original reviewer in either case) and finish off with a statement for those who are considering buying this new package after already having played the originals. 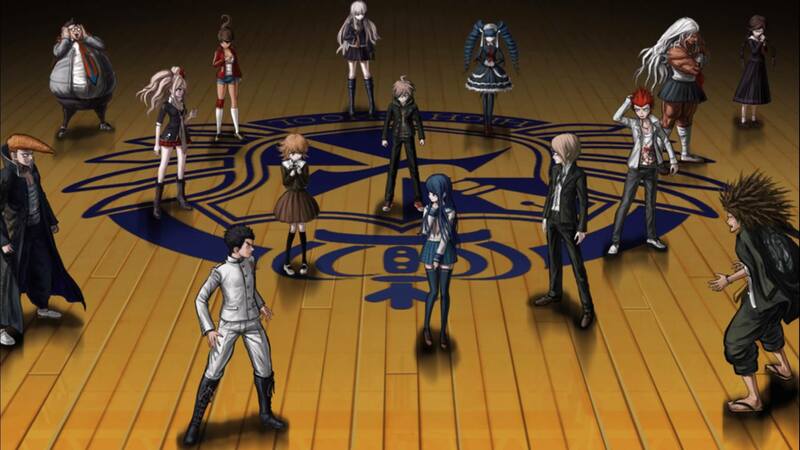 Between games like Danganronpa and movies like Battle Royale, Japanese schools seem crazy. Judged purely by style, you would call these games a murder mystery Visual Novel. However, while there are some similarities to the mysteries in such classic titles such as Steins;Gate or Professor Layton, and there is some similar courtroom drama to the Phoenix Wright series, this game bears a much more horrific tone. I hesitate to refer to this as a horror Visual Novel though, since that tends to draw comparison to things like ghosts, demons and jump scares. Instead it would be best to call the feeling of these games a cross between the classic movie Battle Royale and Phoenix Wright. It is horrific, but the horror stems from the terrible things that people can do to each other. Much of the actual violence in the game is garish and cartoonish, even the blood is a bright shade of pink. However, the reaction of the high school students to the violence turns out to be much less of a caricature than the visuals themselves. The course load is light, but the homework can be deadly. 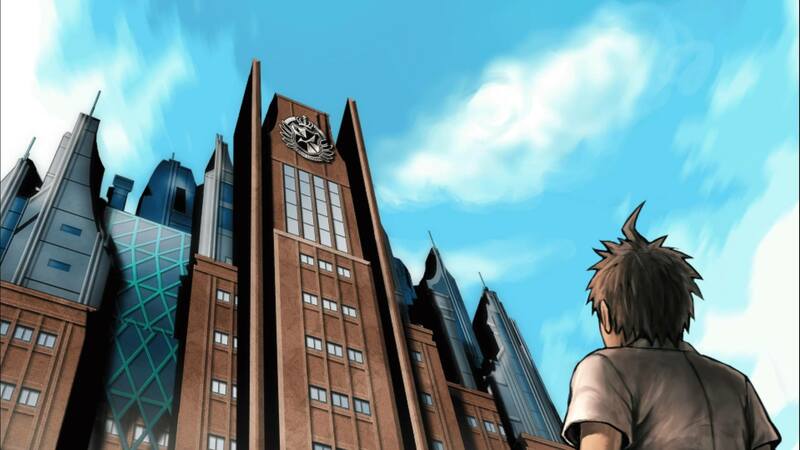 In both Danganronpa games, you start out as a male character who is arriving at Hope’s Peak Academy for his first day of school. That institution is the most famous school in all of Japan, and the only way to receive admittance is if you are the Ultimate of a particular skill set that they are interested in. But what those skill sets exactly are is a mystery, and even after arrival it seems to be quite the extreme rogue’s gallery of prospective candidates. 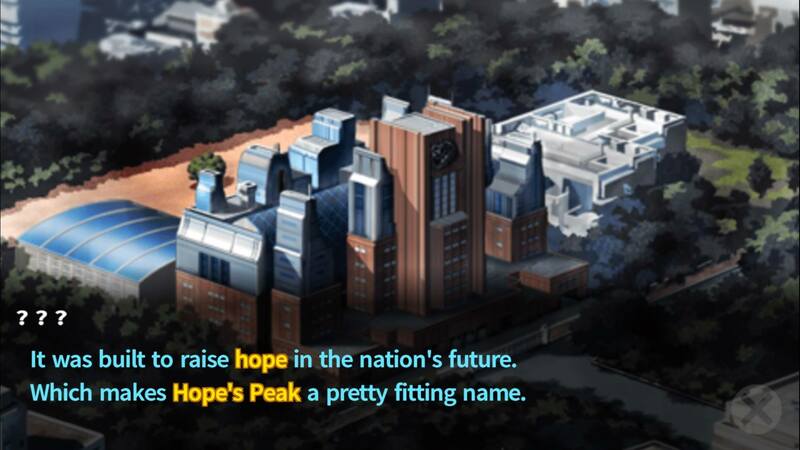 However, should you graduate from Hope’s Peak, it is rumored that you will be set for life and never have to worry about a career or having money again. 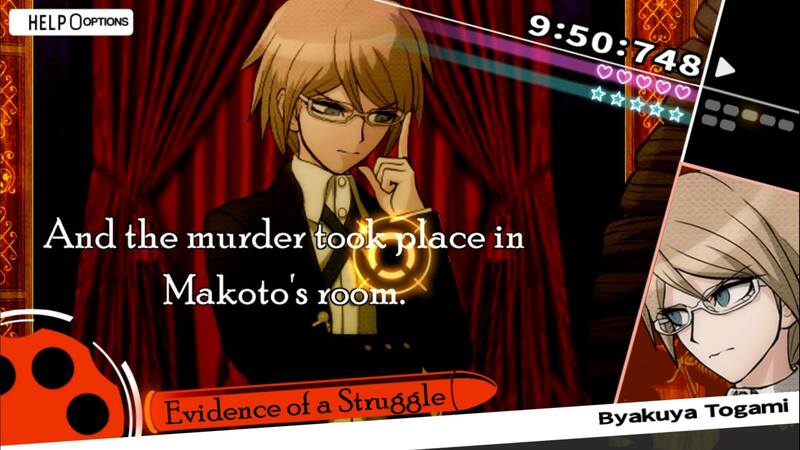 The protagonist of the first game is named Makoto Naegi, and he happens to be the Ultimate Lucky Student, supposedly chosen from a random drawing. That leaves him feeling decidedly out of his element among the other Ultimates, who are already famous in Japan even before their first day of school. The hero of the second game is named Hajime Hinata, and I can’t even tell you what Ultimate he is, because even he doesn’t know the answer to that question for much of the game. In general, Makoto was an easier hero to like; imagine him as the classic Hitchcockian everyman who gets caught up in events beyond his control and stands in as an avatar for the audience. But, even if it’s sometimes harder to like Hajime, the mystery surrounding his situation ended up being much more interesting to me in the long run. The developers obviously wanted to go in another direction with the sequel’s main character, both so it didn’t feel too similar and because they wanted to add a sense of unease with an unreliable narrator. Suspicion and motive lead to murder, and murder leads to despair. Along with the individual murder mysteries, there is a general thematic through line that permeates the entire Danganronpa series, and that is the constant struggle between hope and despair. You can tell that possibly the strongest influence on the making of this visual novel was Battle Royale, which had some powerful social commentary of its own. However, the difference between a movie and a Visual Novel is that you have a lot more time and room to extrapolate on ideas and motivations rather than just making allusions and symbolism. Those things are still there in this game, but they are given a lot more room to breathe and the characters are given far more lines of dialogue to explore the social and philosophical themes surrounding the brutal story. As such, for those who are inclined to enjoy diving deeply into these themes, there is a lot here to love. However, if the ideas around High School students killing each other, capital punishment, and general hopelessness and despair are too much for you, then this is not going to be your cup of tea. For me personally, some of those things were a bit of a struggle to make it through without being too emotionally devastated, but there was enough thematic relevance and philosophical underpinning to all the violence that I was able to set aside the more brutal aspects of the story. As such this has turned into one of my favorite Visual Novel series, and definitely my favorite courtroom style game (I like this much more than Phoenix Wright). The courtroom scenes at the end of each chapter are the only parts that require any gaming ability.